A very British take on the traditional Spanish punch. Half fill a jug with ice. Put all the other ingredients into the jug and stir well. Add more ice if needed. 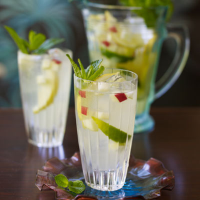 Serve in tumblers, making sure each glass gets some lemon, lime, apple and mint.